Can’t quite believe that the last blog post on here was back in January, well actually I can, but never mind. We’ve ramped up a gear or 6 in the last few weeks in an attempt to get the latest version of Henmore (No.3 as Tim reminded me the other day) actually up and running in time for our Open day in January 2019. There was a somewhat bold statement on the front page of the blog that said the layout would be up and running for our January 2018 Open day. Well sadly we failed, somewhat spectacularly, and missed this by a good 10 months, as the first trains only ran last weekend. Saturday 20th October 2018 was a momentous occasion in the annals of Henmore history, with the first powered movements on the layout. 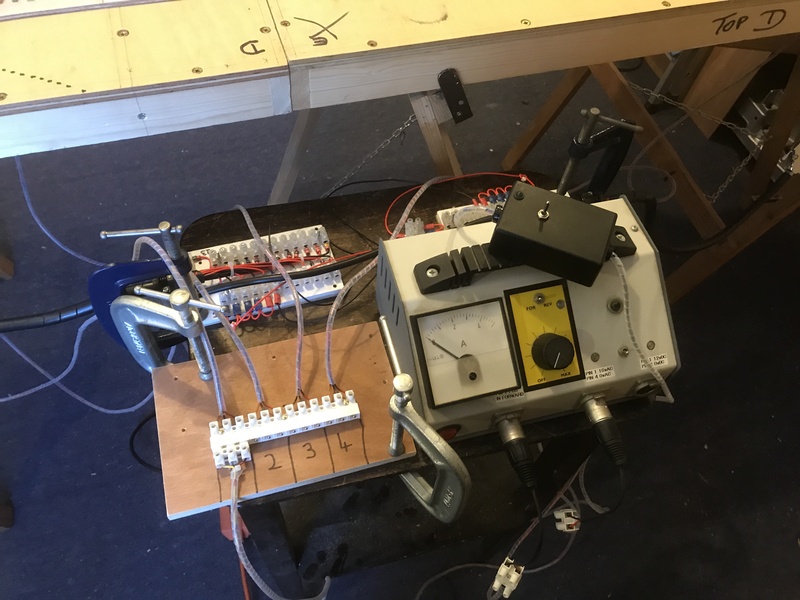 I say first powered trains, we haven’t yet built the control panels (3 of them), but Tim and myself managed a bit of a lash up job in order to test the wiring and make sure it did actually work. Testing times in the electric department – jolly good fun, and it meant that we could check to ensure the wiring on the boards worked – it did! Vertical boiler ‘Ible’ stands on the long siding at the front of the layout, having successfully completed the maiden voyage around the track work on the two new scenic boards which form the station and its environs. 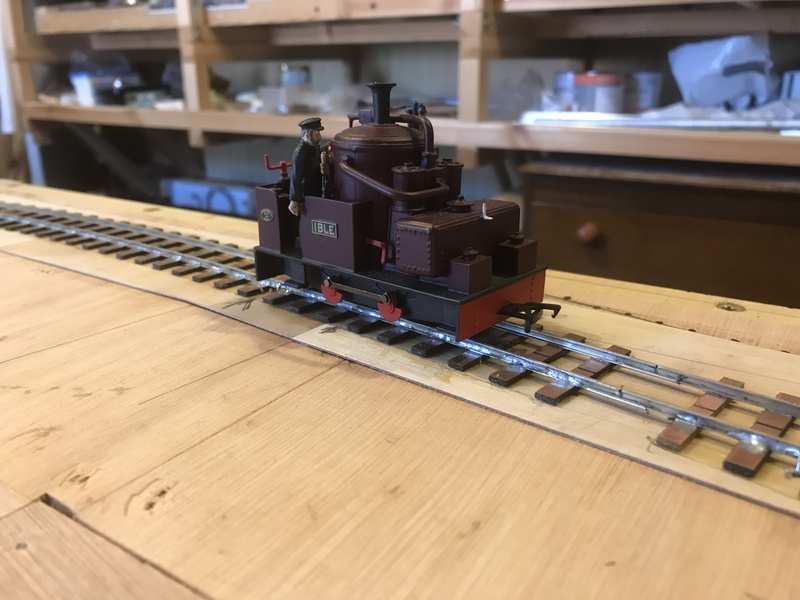 The loco was built by Tim on a Bachmann Gas Mechanical chassis, the body uses part of a Smallbrook Studio ‘Etna’ kit for the boiler and cylinders, with scratch built bodywork. The first train to run on Sandy Lane Halt – a momentous occasion in the annals of Henmore Dale history! Since then, Tim (with assistance from Alex and Andrew) has started to paint the ‘main line’ sleepers (black to match the other boards) and the disused sand quarry track (grey murk as these are long out of use). Tim has also begun adding the scenic formers to the rear of the boards, plus the base for Sandy Lane and the station platform. These two jobs have totally transformed the look of the new boards, and it really does feel like a leap forward has been made progress wise. 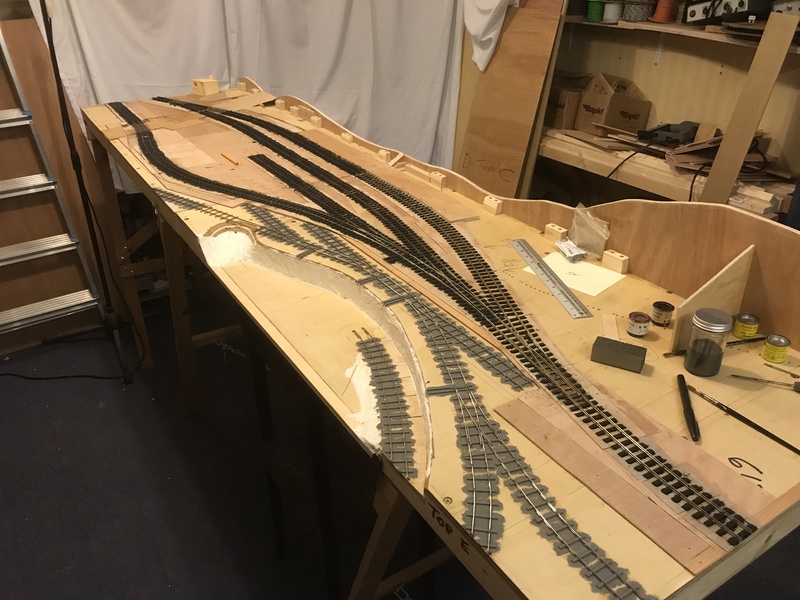 The next, and most important step, is to sort out the control panels, as we really are aiming to have a working layout at our January 2019 Open day (Saturday 26th January 2019 – put it in your diaries now!). We are also aiming to have at least the beginnings of the scenery in place, so Alex, Andrew and I have been tasked with a number of projects to complete before then whilst Tim cracks on with the wiring with our assistance.